I will admit that one problem of which I have often been aware is that it is difficult to make everyone at my theatre aware of the myriad forms of relationships different people have with us. Since there are some people who have been working for the theatre for 35 years, I am actually often less aware of a person’s history with the organization than some of the employees. 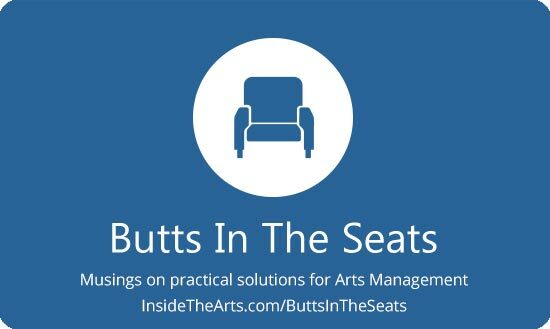 Chad Bauman tackles this very situation in an entry on his Arts Marketing blog. He relates a situation we have all probably been in: A person approaches our organization with a transaction they want to make. However, because their relationship with the organization doesn’t fit into the straightforward rules we have set down, they are not extended the courtesy accorded those less closely involved with the organization. Fortunately, someone who knows the value of the customer’s relationship with the organization is on hand and provides direction. Bauman goes on to talk about the improvements they have made with their practices so that the communications and development departments are contributing to maintaining long term relationships with their constituency and community. But in the course of his entry, I think he also ends up answering the question posed by the title of his entry – “Who are your best customers (and why many don’t know)?” He talks about how they replaced their old ticketing software for something with more integration and then hired someone else to write an algorithm that would alert their staff when they were speaking to someone with a high value relationship with the organization. The best software certainly doesn’t mean anything if the practices of the organization don’t support the goal of cultivating and maintaining relationships with customers. However, I think the impediment to most organizations will be the need to pay to have someone write a custom program for them. On the scale at which the Arena Stage operates, it makes good financial sense to have this done. The return on investment they have seen already with an increase in subscriptions and a decrease in churn probably justifies it. But will that be the case with most organizations? That being said, I feel like I am woefully behind the curve trying to employ the customer relationship management (CRM) features with the ticketing and donor software we do use. In the sense that arts organizations aren’t using whatever resources are available, including integrating their daily practices toward a common goal, I would say Bauman is correct. The thing is…it may be too late to pursue CRM. The trend is apparently heading in the opposite direction. According to a articles Thomas Cott distributed the link to this past week, the government of the United Kingdom is strongly encouraging businesses to give control of customer data back to customers moving from customer relationship management to customer managed relationships. The Government has boasted that the ‘midata’ project will “turn the existing approach towards consumers on its head (with) a shift away from a world in which certain businesses tightly control the information they hold about consumers, towards one in which individuals along or in groups, can use their data or feedback for their own or mutual benefit“. In the context of everyone’s worries about what Google will do with all the information it is collecting on you, this opens the possibility that we may actually find out what it is they know about us. But it also occurred to me that while it may initially be frightening for people to learn what sort of profile has been synthesized about them, it may also prove illuminating if people came to realize their actual practices differed from their assumptions about themselves. For instance, they may attend shows every so many months not really considering themselves a fan of music as much as live theatre only to see that over the course of 5 years there is a record of them attending 12 concerts vs 5 plays. It might encourage people to be a little more open minded and adventuresome with their entertainment choices when they realize their tastes are more diverse than they realized. Sharing that information would actually keep people more engaged and interested in your organization. It would probably also solve the problem of people creating multiple ticket accounts I groused about a couple months ago if they had a reason to use the same account for every interaction with your organization. Which means the organization has a much better sense of their relationship with the person since the history isn’t dispersed across multiple accounts. CRM has been invaluable to companies because customers have had an expectation for decades now that if they patronize a place regularly, it will be acknowledged in some way whether it is the amount of starch in their shirts or the way they take their coffee. Even though CRM may be on its way out, many of the customer service practices it allowed companies to extend aren’t going away. Even if you have been behind the curve on using CRM software effectively (or at all) you still have an opportunity to participate in the next phase of relationship building.